"Ransomware" may be a term you haven't heard before. This type of criminal malware, which spread around the world on PCs in 2012, encrypts some or all the files on a computer and holds them for ransom and Cyber thieves have already made millions through such methods. Ransomware is no longer all about computers. It has evolved to now target mobile devices, specifically Androids platform. For a hacker, a pop up message is just one more way to steal money by sending fake alerts and serious warnings that scare a user into making a payment. For example, in the case of PCs, we have encountered malware that encrypts crucial data on a user’s hard disk, asking the victim to pay a sum to the attacker in order to recover his/her data. 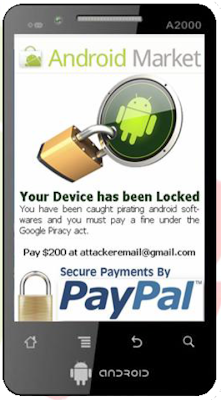 Last year in November at many Hacking Conferences, Security Researcher Mohit Kumar (@Unix_Root) already demonstrated one the most sophisticated android malware called "Android Malware Engine", one of its kind yet , that includes the first Android malware Mobile Ransomware worm ever seen. 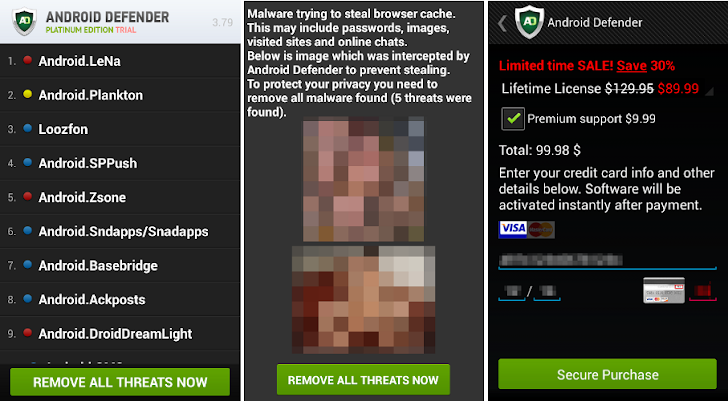 Last month Symantec had discovered bogus android antivirus software, dubbed Fakedefender. The Fake Android Defender application displays a false malware detection in an effort to gain the victim’s confidence and to con you into paying for software to remove the infection, while ransomware locks up your mobile device and prevents you from using it at all until the ransom is paid. You won't be able to open any new apps, and ultimately will make your device unusable, until you pay for it. Ransom demands vary and can be anywhere between $30-$100. Cybercriminals have been found to earn up to $30,000 a day on scams such as these! The key to staying protected against these threats is to ensure that you do not get them onto your device in the first place. Android is open and allows you to download and install apps from virtually anywhere, but those apps might not be vetted and often can't be trusted. This year at 'The Hackers Conference', Mohit Kumar is going to talk about "RiskyDroid - Malicious and Spying backdoors in Popular Android applications". Their presentation will cover the demonstrations of amazing Surveillance, Malicious and Dangerous backdoors in top Rated popular Android applications. Android has something more important than a normal cell phone like email accounts, bank accounts, your personal pictures, your call recordings and many more and do you really think that your Droid is perfectly safe and all your personal information is in safe hand with Google, Facebook, WeChat, Whatsapp or Truecaller ? If yes, then you are in big trouble! Make sure you are going to attend 'The Hackers Conference' 2013 this year in New Delhi on August 25th 2103 to understand that how genuine applications are Spying on you for Intelligence Information Gathering and stealing your Private Data, exploiting your Privacy.